On the 4th day of my echolocation training, Daniel is teaching echolocation for the day. He started with the usual panel exercise outside his house. 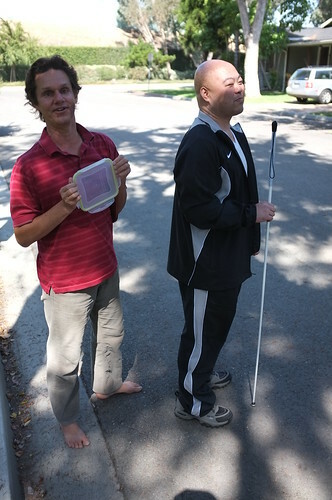 The panel exercise is conducted by an instructor standing behind me, holding a 'panel' such as a dish or a plastic lid, around my face, and I click my tongue at it and echolocate the panel by touching it with my hand. I found it's a bit difficult for me to detect where he is holding the panel because his motion is totally silent! In addition to that, I noticed he moves the panel time to time, allowing me to find it in less time! With juan, it was rather easy because I sort of could tell where he is holding a panel by his arm movement, but I could no longer 'cheat' with Daniel! 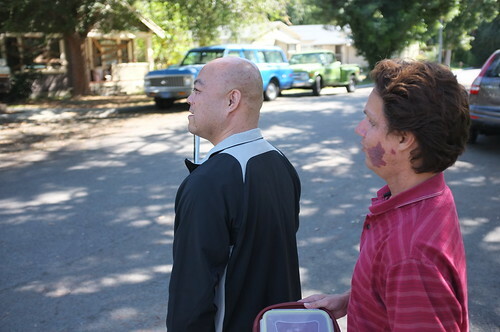 Then, an another echolocation and perceptual mobility training with Daniel started.